This article is part of a web dev series from Microsoft. Thank you for supporting the partners who make SitePoint possible. And suddenly you find yourself wondering: is there any solution to automate all these tools? How can you create a repeatable workflow to prevent you from doing mistakes? Obviously a solution exists, and two tools in particular are waiting for you to get started: Gruntand Gulp. As a newbie using these tools, you are wondering how they work and which one to use, aren’t you? Well perfect then, you are reading the right article! You need to understand first how Node.JS Package Manager (npm) works. Npm is the tool provided with Node.JS. It is used to get tools and frameworks while automatically resolving their dependencies. This file is important for Grunt and Gulp because it will contain the list of plugins downloaded and usable in your automation workflow. You will go through some questions that you can answer using the default option, then you will be all set to start. 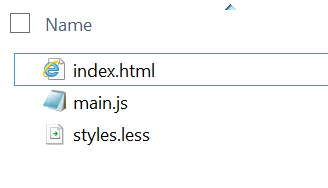 The third one will create a devDependencies section / property inside the package.json file. The basic principle for Grunt is to give us an easy way to run tasks. A task is a set of code files and configuration files already created for you. You can get new tasks by installing Grunt plugins that you will get using npm. You can find a plugin for pretty much every tool you might use, such as Less and JSHint. To run Grunt, you have to create a Gruntfile in which you specify which tasks you want to run and the configuration for each of them. Once this is done, you only have to run the grunt command line specifying the task you want to run (default or a specific one) and it will do it automatically. Now let’s go through a step by step guide to set up all this. You need to install Grunt globally to get the command line and locally to initialize everything needed for the project. Note: Do not forget the –dev part for it to be specified as a devDependencie in the package.json file. Grunt expect the file to export a single function which take one parameter named grunt. You will use this object to perform all Grunt related actions. 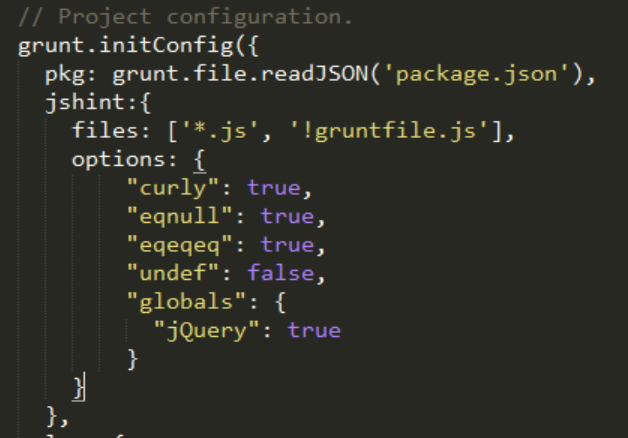 Here is a minimal gruntfile that only read the package.json file and create a default task which runs nothing. You can execute it to be sure everything is configured correctly. Let’s add is to your grunt workflow. If you search for JShint on the grunt plugins page, you will find grunt-contrib-jshint (here) which corresponds to what we need! The configuration is done in the initConfig function where you have to add a new property to the object given in parameter. This have to be the name of the task you want to add and is related to the plugin you use. The best way to know that name and the list of available options for the task is to have a look at the plugin documentation. You will always find a well-documented sample. You just have to run that command and it will automatically prompt you for any errors it encounter. Congratulation, you now have a task automated in your grunt workflow! 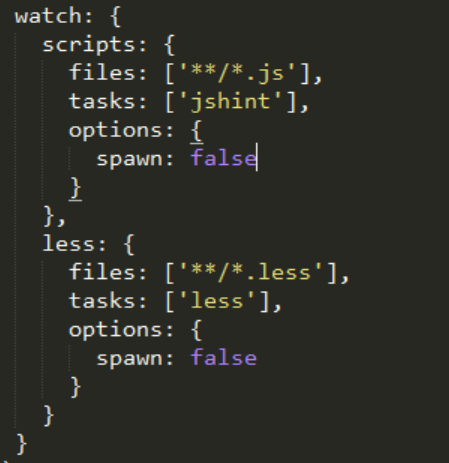 Your JShint task works well but it is a little bit alone in the workflow. Usually, we are using tools like grunt to run more than one task. You can now run Grunt and specify the less task: this will launch only less. That is OK but you want to run all the tasks right? That is the role of the default task. You can add any task you want, and you can also specify other group of task like default and call them by passing their name as an argument to the grunt command line. Now, you are a happy developer. All you repetitive tasks are automated inside a grunt workflow and you just have to run grunt for them to execute. But that can be done even more easily. That can be done automatically. To do that, you can add a specific task named watch. This task will constantly inspect your working folder and, based on rules, when a file is modified, grunt will run an associated task. Load it like all other tasks using the loadNpmTasks function and configure it. The config part is a bit different here because you need to specify a configuration for each task you want to cover using watch. And it will execute tasks each time a file is changed and this file is in the scope of watched files for the specific task. And that’s it! 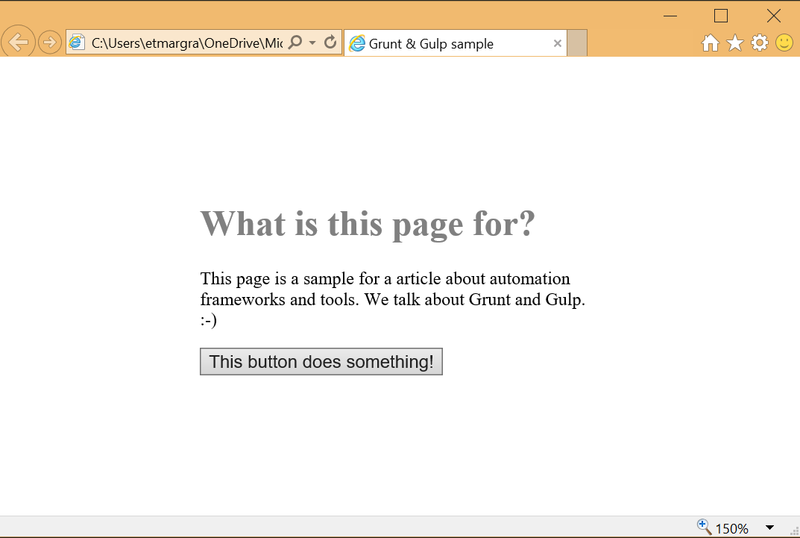 You now know everything to create automated workflow using grunt. Gulp is an alternative to grunt. It is a bit more recent and has a reputation as being more flexible than grunt. Before choosing which one you will use, let’s have a look at how gulp works. Gulp (http://gulpjs.com/) is a workflow automation tool. Like grunt, it works using npm and the package.json file. All available plugins will also be downloaded using npm and added as devDependencies in the package.json file. 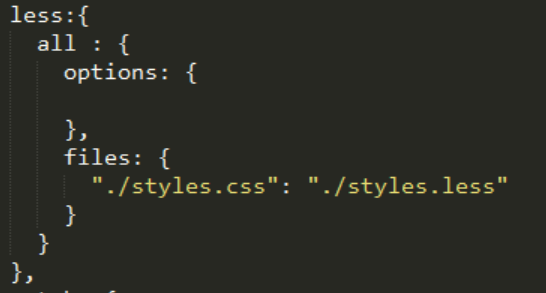 One of the main differences with Gulp is that it uses streams. A stream is a set of functions through which a file will go and be modified in memory. The file will be written on the disk only at the end of the process so it is more efficient. Grunt tasks, on the other hand, work as silos and cannot be chained. Let’s have a quick look at how Gulp works by following a few easy steps. Similar to Grunt, you first have to create the package.json file. You can use the exact same technique you used for the grunt sample. This will install the gulp command line and everything needed to run a gulp workflow. 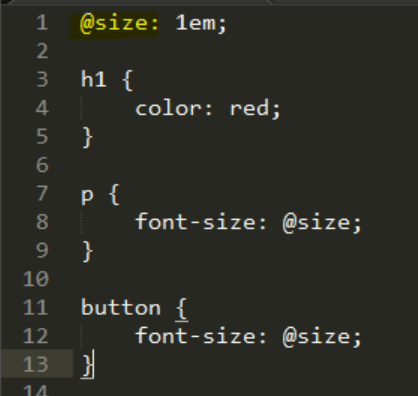 As you can see it is a bit different from the grunt syntax. In gulp, plugins are loaded using the require syntax as you might be used to if you are a nodeJS developer. 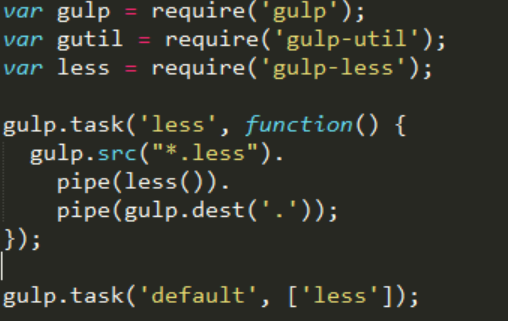 There is also a default task defined using the gulp.task function. To use a plugin, you call it using the name you chose when require-ing it. Usually, you call it as part of a streaming workflow which generally starts with a selection of files. This is done with the gulp.src function. It will select a bunch of files and return a stream that can be used by another function using pipe. That is how you can chain multiple actions without writing them to the disk. You just pass the stream from one plugin to another. We first require (‘gulp-less’) to load the less plugin for gulp. (We got it using npm install gulp-less --save-dev). Then gulp.src will select all the .less files, we ‘pipe’ it to the less()function and it finally is ‘piped’ to gulp.dest which indicates where to write the result. As gulp.src can select more than one file, gulp.dest specifies a folder. Once you understand the piping model, you can easily get the same result as the one we got using grunt. The power of gulp is that you can create custom task in which you call more than one plugin and where you can associate them the way you want. Note: there is obviously also a gulp-watch plugin you can use to automated the launch of your workflow! Conclusion: which one to choose? I hope that you have now a clearer understanding of why you need an automation workflow and how you can use grunt or gulp to get it. Choosing one of them is more related to the task you want to achieve. Grunt is easy to use. You do not have to understand the piping system and achieving simple task will be more straight-forward. It is a really mature tool, used by a lot of known editors and developers and there is a lot of plugins available. Once that said, the way gulp is designed can give you a lot of flexibility. It has existed for quite some time now and even if you won’t find as many plugins as you will for grunt, all the classic ones are available for gulp. If you are using a really standard workflow with common steps like jshint, uglifying, css validating etc., Grunt is a good choice. If you are up to more complicated tasks, gulp will be a good wingman. Etienne Margraff is a Technical Evangelist for Microsoft. Heâ€™s a core contributor to the Vorlon.js project. Read his blog for follow him on Twitter.